Under arrest by the Metropolitan Police Service in London under extradition warrant. 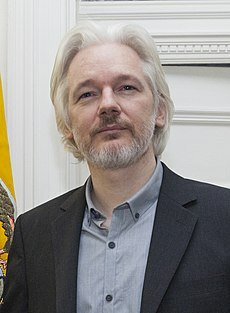 Julian Paul Assange (born 3 July 1971) is an Australian-Ecuadorian computer programmer, publisher and journalist. He is a spokesman and editor-in-chief of WikiLeaks, which is a website that posts news leaks. He started the website in 2006. He was born in Townsville, Queensland. He also made a program called Rubberhose to hide secret information in a specific way that protects against torture. Assange was the Readers' Choice for Time Person of the Year in 2010 after getting the most Internet votes. However, Mark Zuckerberg, who started Facebook, won the actual award. In 2012, facing extradition to Sweden, he was granted political asylum by Ecuador and took refuge at the Embassy of Ecuador, London. On 11 January 2018, it was announced that Assange had held Ecuadorian citizenship since 12 December 2017. Ecuadorian President Lenín Moreno said on 27 July 2018 that he had begun talks with British authorities to withdraw the asylum for Assange. On 11 April 2019, Ecuador withdrew Assange's asylum and he was arrested by the Metropolitan Police shortly afterwards. ↑ "Mystery Hacker: Who Is WikiLeaks Founder Julian Assange? - TIME". time.com. Retrieved December 15, 2010. ↑ "Julian Assange: Readers' Choice for TIME's Person of the Year 2010 - TIME NewsFeed". newsfeed.time.com. Retrieved December 17, 2010. ↑ "Ecuador grants WikiLeaks founder Julian Assange citizenship". The Independent. 2018-01-11. Retrieved 2018-01-11. ↑ Barnes, Tom (27 July 2018). "Assange will be removed from London embassy 'eventually', Ecuador says". The Independent. Retrieved 29 July 2018. ↑ "Julian Assange arrested in London: Live updates - CNN". 2019-04-11. Retrieved 2019-04-11. This page was last changed on 11 April 2019, at 16:24.